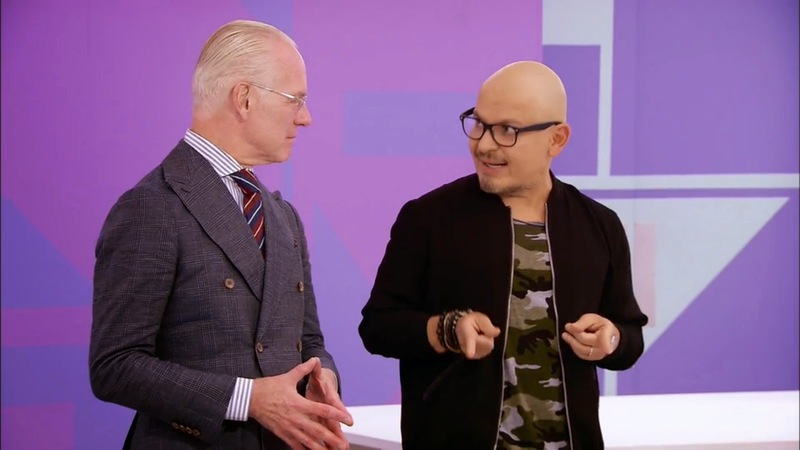 Tim Gunn and Luis Casco, Mary Kay Global Makeup Artist--Episode 10 "Project Runway"
On last week's "Project Runway" on Lifetime, it was time for another sponsor to get the spotlight. This time it was the Official Makeup Sponsor for Season 13, Mary Kay. Tim Gunn and Luis Casco, Mary Kay Global Artist, introduced the "Mary Kay Challenge" to the remaining designers. Designer Alexander Knox and a random young woman not wanting to participate--Episode 10 "Project Runway"
Designer Kini Zamora and his muse, on a bench in Washington Square Park NYC--Episode 10 "Project Runway"
New Model Form: While watching the episode, I was intrigued at the sight of something I hadn't really seen before in any season of "Project Runway"--adjustable forms. For previous "Real Women" challenges, the designers just had to "Make It Work", like add shoulder pads or folded muslin to the regular forms to "pad them up" to the size of their "Real Women". But this season--and for this episode--the designers got some MAJOR help--with the additional use of these "adjustable" body forms. I'm sure there are many a past "Project Runway" contestant right now bitter about the fact that they didn't get that luxury. On a similar note: I'm still bitter that we didn't even have dotted pattern paper back in Season 2! We had to take our draped muslin pieces and use it as our pattern to cut our fabric, which was NOT an easy task. ZipperGate: Tim had given the 2-minute warning for time, and Char Glover's model put her romper look on and while trying to unzip the zipper, it "broke". Well, kids, I don't think that's really what happened. If you want to know what I think occurred...you'll have to read my RECAP HERE. Judges: (L to R) TV Host and Model Asha Leo (who? 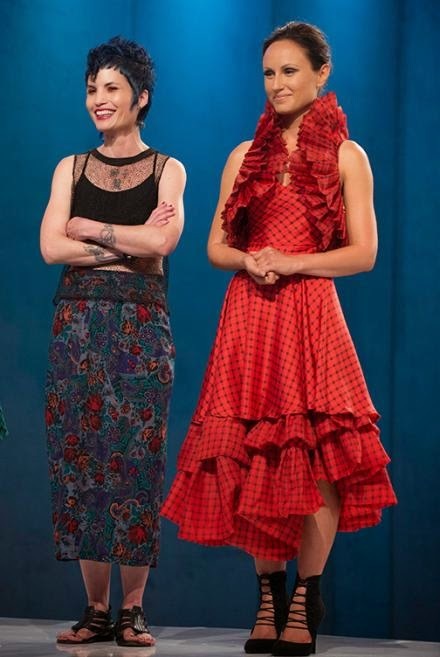 ), actress Michelle Monaghan, Nina Garcia, Zac Posen and Heidi Klum--Episode 10 "Project Runway"
Emily Payne: Designer Emily Payne created this "Flamenco Fab" look for her muse, Julia. 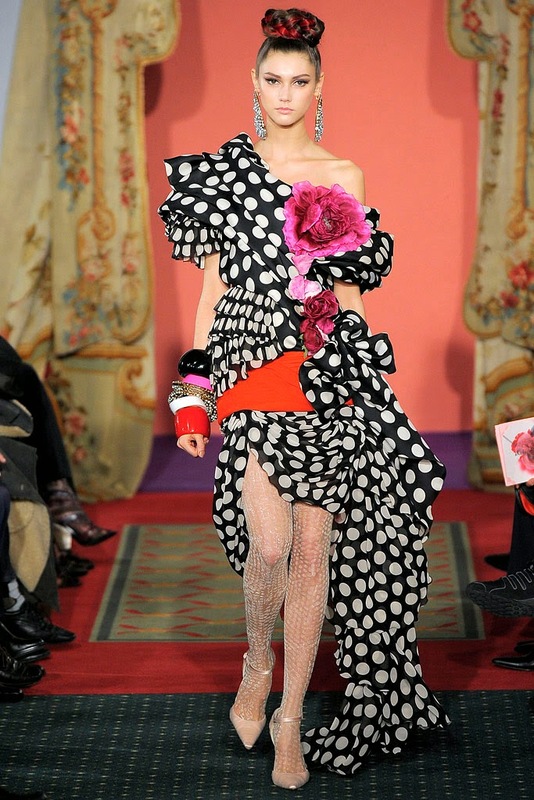 I LOVED the fan top and red/navy blue polka dots but thought she may not have needed such a full, tiered/ruffled bottom; the "Star" and only interest should have been that neck ruffle. Nevertheless, it was quite unique and exuberant. And best of all, her client/model/muse loved it. Kini Zamora: Kini did a very good job here with this denim ensemble for his muse. She wanted to go out on a Date Night. I thought she looked older (in a good way), mature, and more dot.com entrepreneur as opposed to bedraggled and broke college student. Korina Emmerich: Korina's creation was the Winner. Her deep purple leather moto jacket with boucle front was excellent and chic. And I really liked how she incorporated her model's Ballet influence (she's a ballerina) into the fan pleated skirt. Well done!...although I will say that those booties were a BAD styling choice. 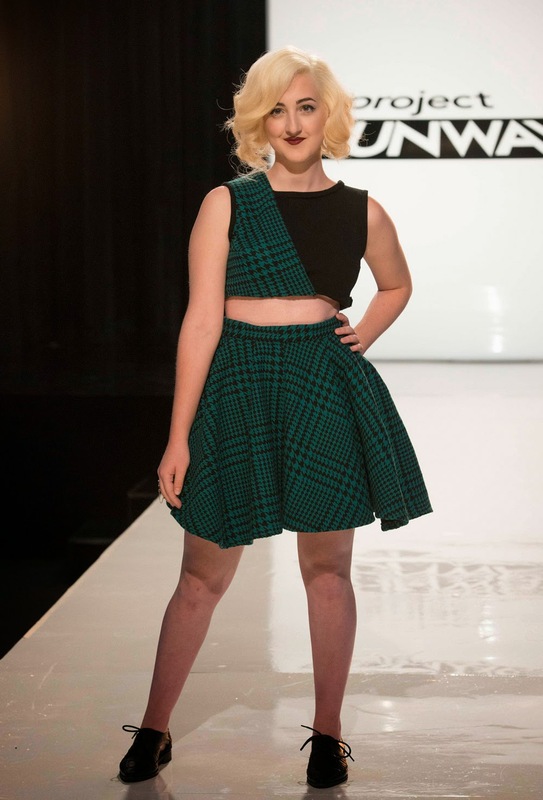 Amanda Valentine: The positive: I like the striped print. Negative: Lots; it's waaaay too short--both the entire length and the short-waist, the corners point downward, and generally, it isn't flattering. It's like she put on a dress that is two sizes too small for her. 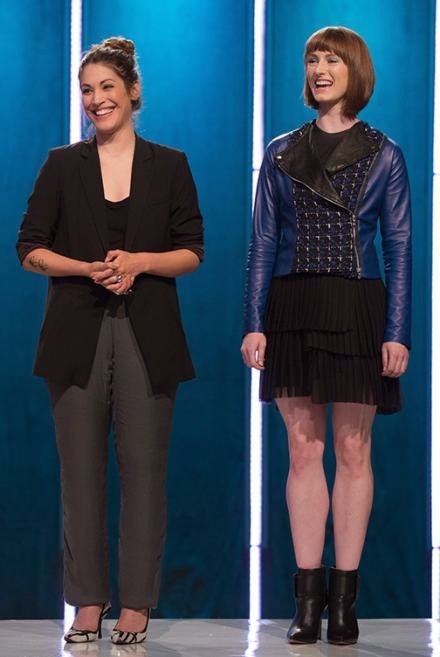 Char Glover: After Tim gave Char an extra 10 minutes to put in another zipper, her model luckily walked the runway without having to hold her hand down her side to cover a busted zipper. She's a pre-school teacher and wanted an outfit to go out in. This might be appropriate for Vegas but other than that, it's two seconds from being too hoochie. Alexander Knox: Two days and he did this?? And this was his SECOND creation since the first was deemed "Hideous" by Mr. Gunn. If that one was hideous, this one was "MEH! "; it looked like she had made it herself in her first Home Economics class in Jr. High School. It was badly made, badly styled and looked like Amateur Hour. I feel that if Tim hadn't crucified him in the critiques, he possibly could have done better with his original creation. This week’s episode begins with a quick, yet telling, intro: TWO clips from the previous week’s challenge showing Still-in-Design-School Hipster Boy Alexander. I thought this was odd considering the fact that he was barely a blip in last week’s challenge. Then, I surmised: “Uh Oh! He’s going OUT this week!” Yes, kids, I’ve become a bit too savvy even for the “Project Runway” editors. Time for this week’s recap including my two cents on what I think of Char’s zipper snafu drama plus much more. In addition to the clips of Alexander, the intro is highlighting two other things. First, the designers are discussing NY Fashion Week, since they all know by now (in terms of numbers) that they will be showing their collections, whether as a decoy or a finalist; and secondly, they're all talking about winning the show. The designers meet up with Tim Gunn and Luis Lasco, Mary Kay Global Makeup Artist (gotta love those titles). Luis discusses that the Mary Kay brand stands for "Discover What You Love" and that it’s about helping women discover both their inner and outer beauty. With that, Tim announces that it’s the Mary Kay Challenge: to create a makeover look for randomly selected muses. He tells the designers that they are going to Washington Square Park and have only 30 minutes to find their models/muses. They are also getting an additional 30 minutes to chat/take their measurements and $200 for materials. Best of all, it’s a two-day challenge. To Read the rest of my Blog Recap, Click HERE! 1 Response to "PROJECT RUNWAY.....Season 13 Project Runway Episode 10 Recap: Mary Kay Challenge"
I think Alexander shouldnt have listened to Tim Gun and should gave gone ahead with his original creation. Others have not listened to Tim and were just fine on the runway. Alexander should be given another chance. As for that extra 10 minutes it shouldnt have happened. That designer had the full allotted time to get it right. Tim Gun had a bad day and got it all wrong.